For many Veterans who suffer from Post Traumatic Stress Disorder (PTSD), issues might arise during the hospice journey affecting both patients and their care team. Lack of communication or avoidance of past events may trigger difficult memories or feelings of isolation. The need for personal control may conflict with a reliance on hospice staff or the expertise of the care team. 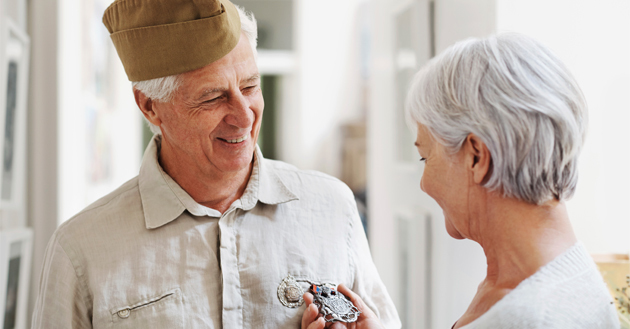 Understanding the needs of Veterans facing the end of life may help healthcare professionals when caring for Veterans within their hospice program. We Honor Veterans, a program of the National Hospice and Palliative Care Organization (NHPCO) in collaboration with the Department of Veterans Affairs (VA), invites hospices, state hospice organizations, Hospice-Veteran Partnerships and VA facilities to join a pioneering program focused on respectful inquiry, compassionate listening and grateful acknowledgment. MNHPC collaborates with the VA Midwest Healthcare Network to provide support for over 50 hospice providers across Minnesota that have created a We Honor Veterans program. MNHPC provides education on specific health concerns and issues that affect Veterans and trains providers on Veterans benefits.